This white paper seeks to outline how businesses and marketers can use specific strategies and tips to dramatically boost the results of their campaigns, quickly and easily. 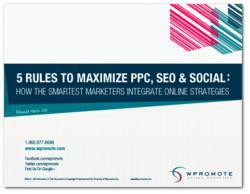 Wpromote, an award winning online advertising agency providing integrated services for clients such as Toyota, Behr, Zenni Optical, and RG Barry, is proud to announce the release of their latest white paper, “5 Rules to Maximize PPC, SEO, & Social Media: How the Smartest Marketers Integrate Online Strategies.” The white paper outlines five key strategies to follow with the conclusion that by investing in integrated strategies across search, social, display, and email, your online marketing campaign can produce results far in excess of the sum of their parts. "One of the most pervasive trends in online marketing is not even so much the blurring of the lines between disciplines of SEO, PPC and Social Media, but the outright overlap and integration in the way these work together and effect each other,” said Michael Mothner, CEO and Founder of Wpromote. “This white paper seeks to identify the largest examples of these overlaps and outline how businesses and marketers can use specific strategies and tips to dramatically boost the results of their campaigns, quickly and easily." With the constantly evolving field of online marketing, Wpromote’s white paper breaks down the latest strategies essential to running successful marketing campaign in today’s marketplace. Strategy 1: Businesses should always invest in an integrated SEO and PPC effort, which leads to reaching more users and results today, as well as in the long run. Strategy 2: It is key to integrate Facebook ‘Like’ and Google ‘+1’ buttons into your website, as the more people that utilize these buttons, the bigger impact it will have on your paid and organic rankings. These social endorsements will likely improve your conversion rate. Strategy 3: Be active on Google+ in order to dominate the search results of your followers and connections, as not many brands and companies have taken advantage of this outlet yet. Strategy 4: Use PPC text ads as a testing ground to determine your messaging, and then apply those successes to the rest of your marketing campaign. Strategy 5: Use your best performing PPC keywords to determine your SEO keyword strategy with the highest return on investment. To learn more about how to effectively maximize your integrated online marketing campaign, be sure to download Wpromote’s free white paper. Founded in 2001 by Michael Mothner, Wpromote is an award winning online advertising firm headquartered in El Segundo, CA. Wpromote has helped over 37,000 clients grow their businesses online. With unmatched experience in search marketing and an unrivaled dedication to our clients' results, we always stand out above the crowd. The 70+ employees at Wpromote currently manage more than 3,500 clients spanning a wide range of industries and verticals in over 60 countries worldwide. A few integrated search marketing clients include Bayer HealthCare, Vans, Toyota, Allied Van Lines, HP, Southern California Edison, Symantec, Fisher-Price and Universal Music Group.